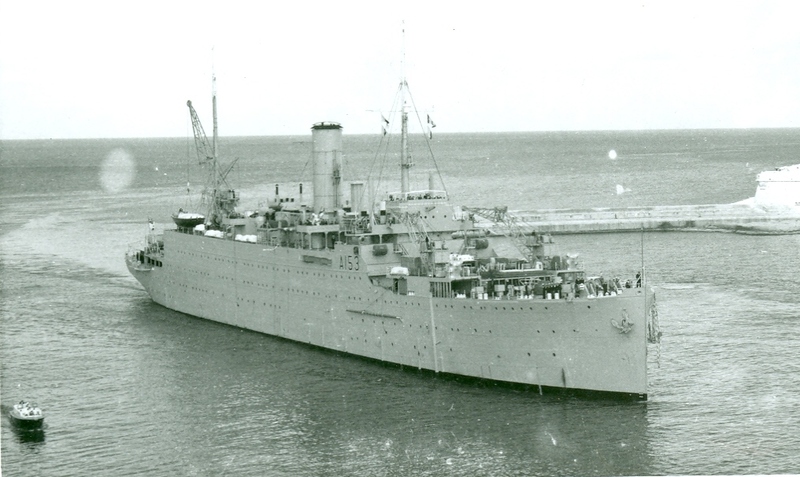 HMS Ausonia left the East Indies fleet on the 14th June 1946 and returned to the UK where her crew were paid off. Shortly afterwards she was moved to Greenock, where she became part of the reserve fleet. 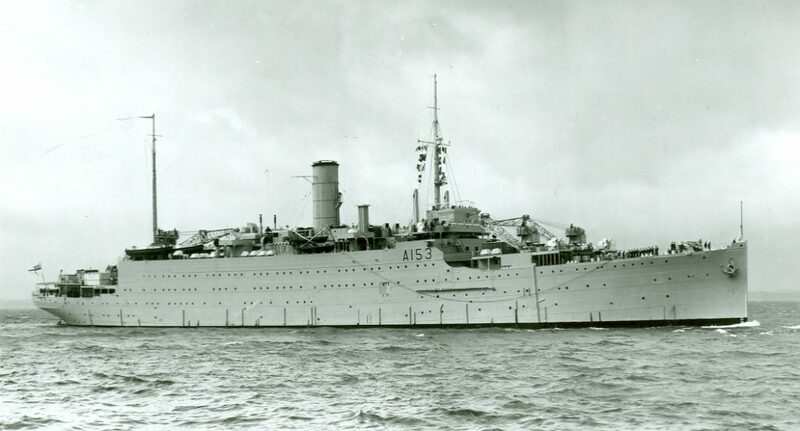 During the period July 1947 to June 1949 she was based at Chatham, where she served as flagship to the Officer Commanding the reserve fleet there. The next few years were spent either in Chatham or in Scotland. 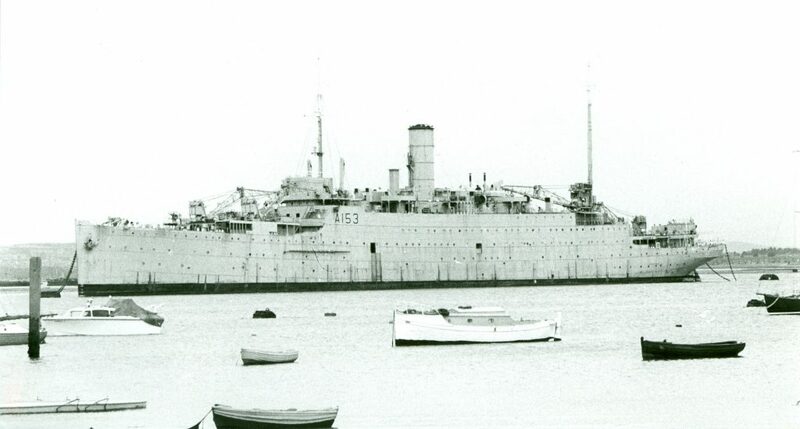 HMS Ausonia laid up in Sheerness in April 1950. 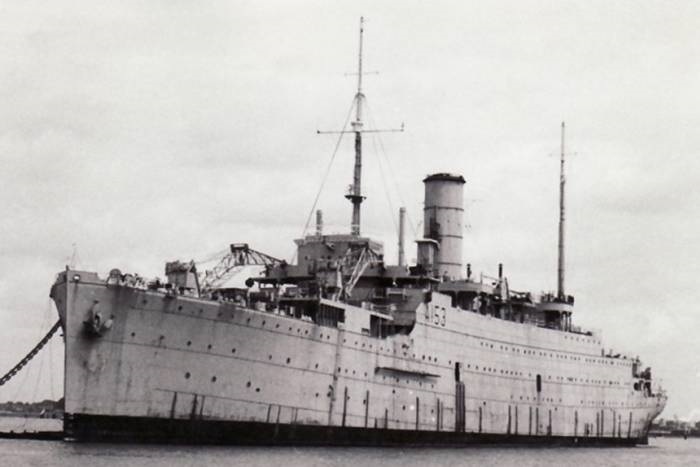 The Depot Ship, HMS Forth, with HMS Ausonia in the background. 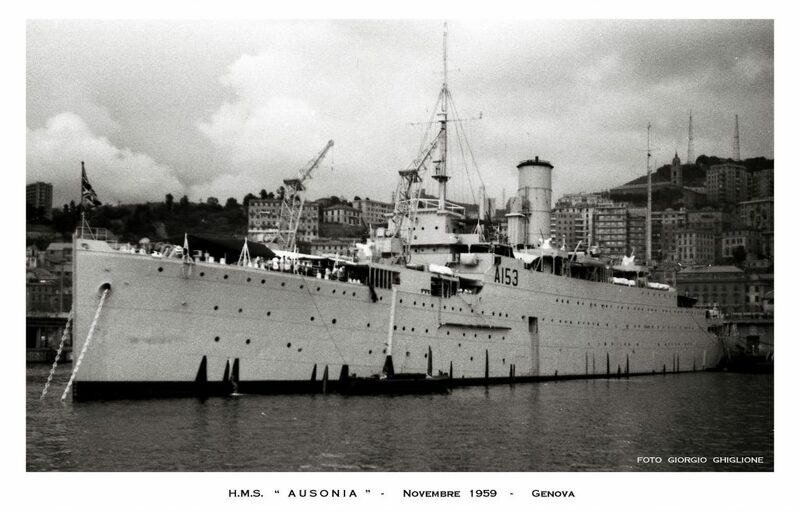 The photograph is not dated but as the Ausonia does not yet have her pennant number painted on the hull and also has many of her deck fittings removed, it is assumed to have been taken late in 1950. 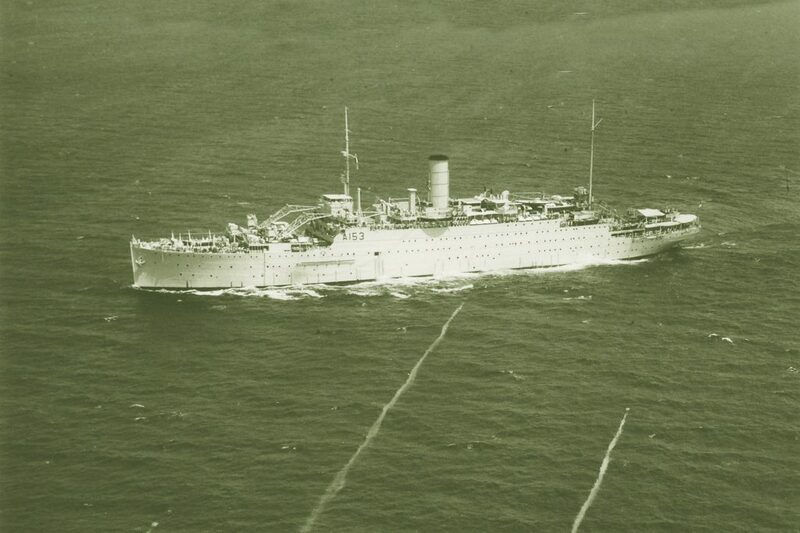 A major refit on the ship began in 1951 which was not completed until 1954. The work was extensive and it included the fitting of new boilers which had been taken from an old destroyer. She then moved to shipyards in Millwall, where she remained inactive and in preservation until June 1957. 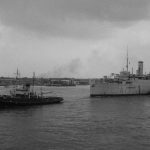 Her future looked very uncertain, but a reprieve came with the decision to use her as a replacement for HMS Ranpura, which was at this time, the heavy repair ship in Malta. 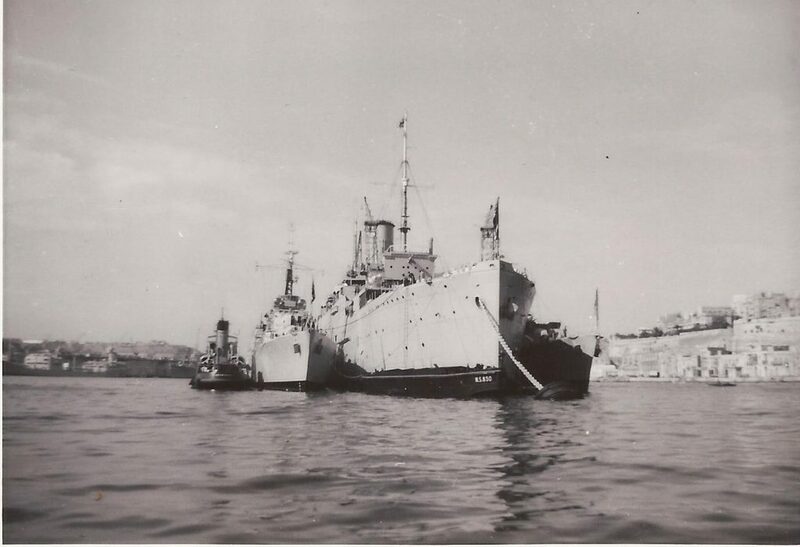 The heavy repair ship, HMS Ranpura, stationed in Lazaretto Creek, Malta, was relieved by HMS Ausonia in September 1958. 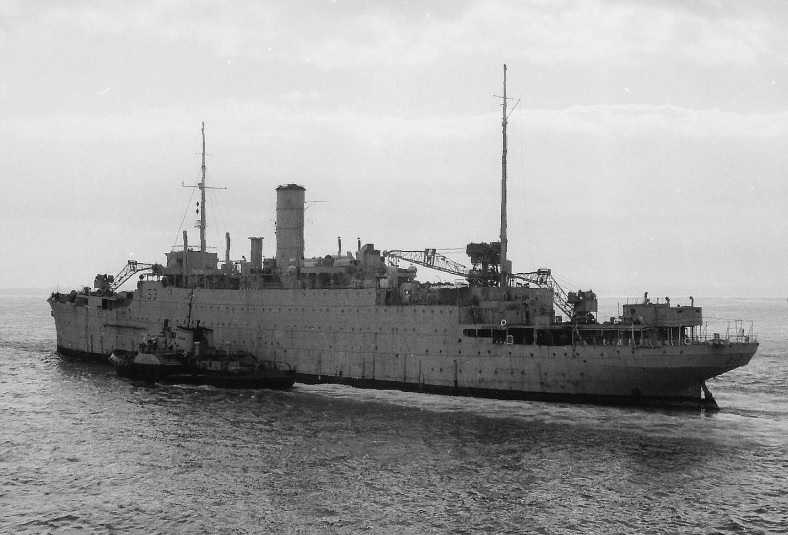 HMS Ausonia was towed to Devonport and had a further refit. 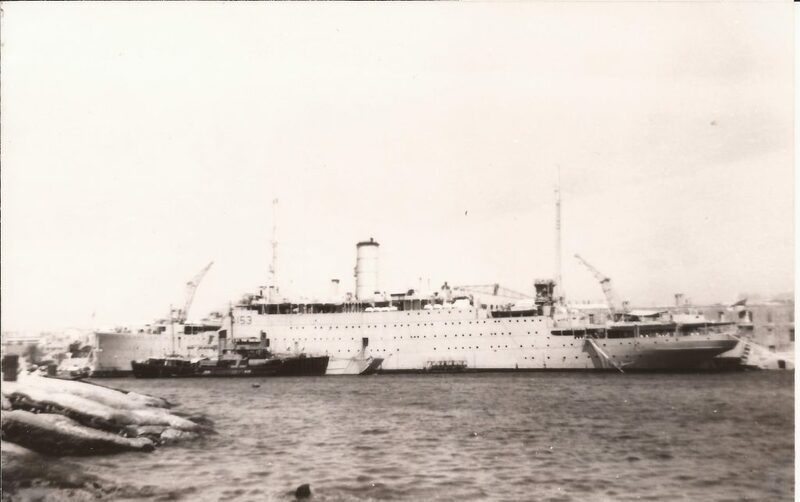 She re-commissioned on the 16th September 1958 and after undergoing trials she sailed for Malta, arriving alongside the Ranpura in Grand Harbour, in October. 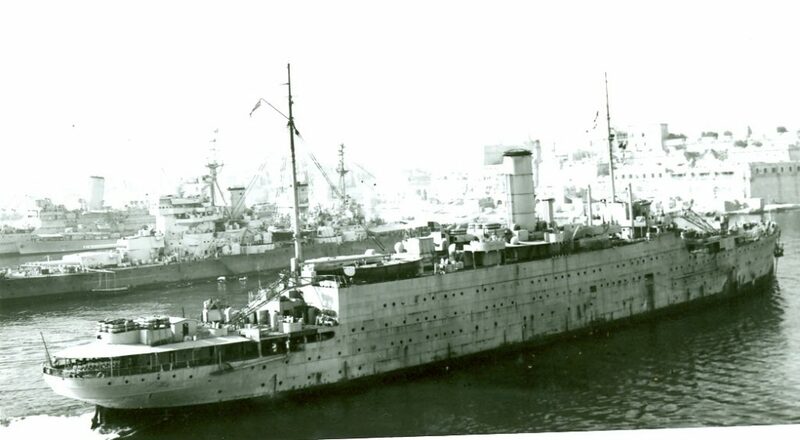 There then followed 2 weeks of hard work as all the stores and equipment were transferred from the Ranpura to the Ausonia, the former vessel rising higher out of the water and the latter sank lower as the heavy equipment was moved from one ship to the other. 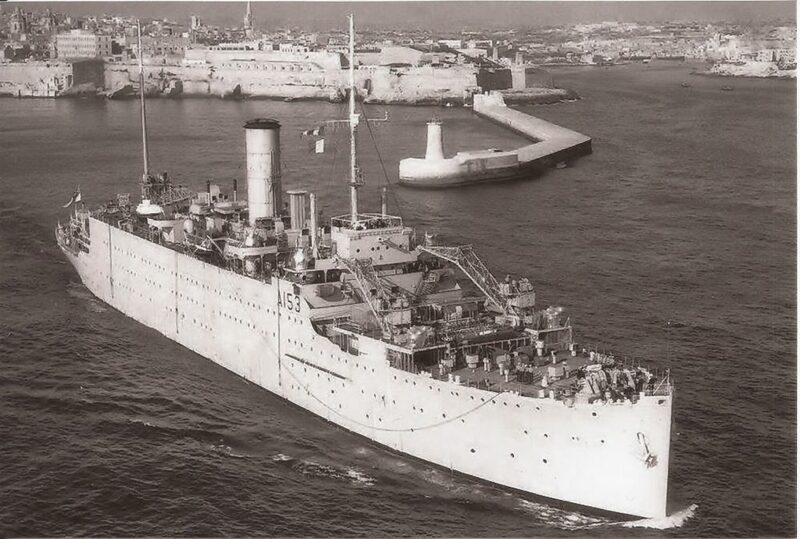 Once this had been completed, the Ranpura’s crew themselves transferred to the Ausonia and the latter’s steaming crew, who had brought her to Malta, took Ranpura back to Devonport. 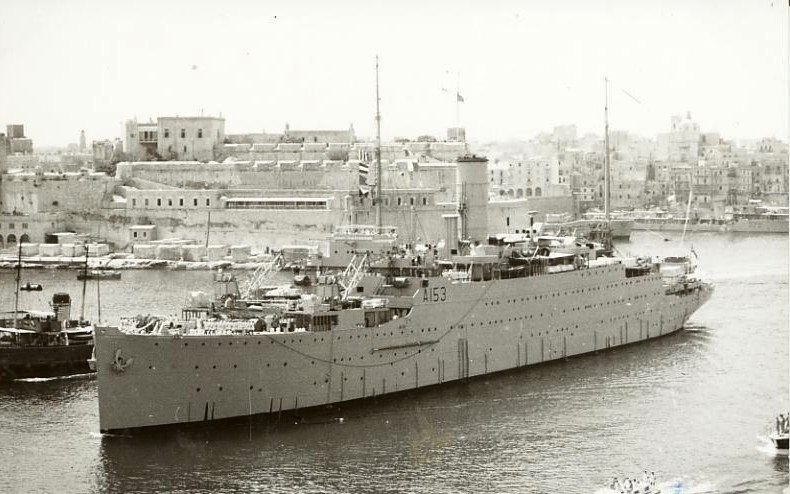 HMS Ausonia arrives in Malta in September 1958. 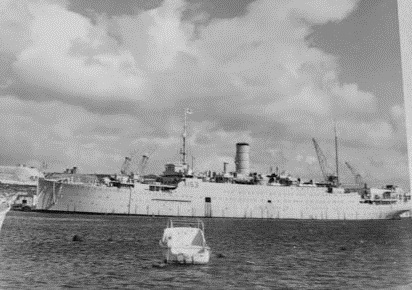 HMS Ausonia in Malta, September 1958. 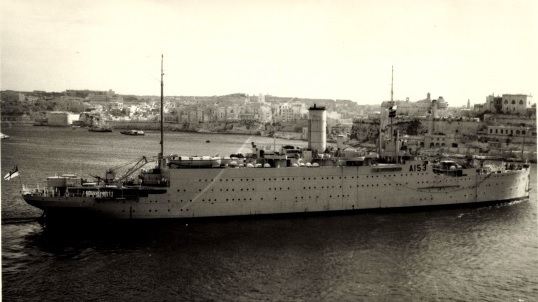 Another photograph of HMS Ausonia in Malta, September 1958. 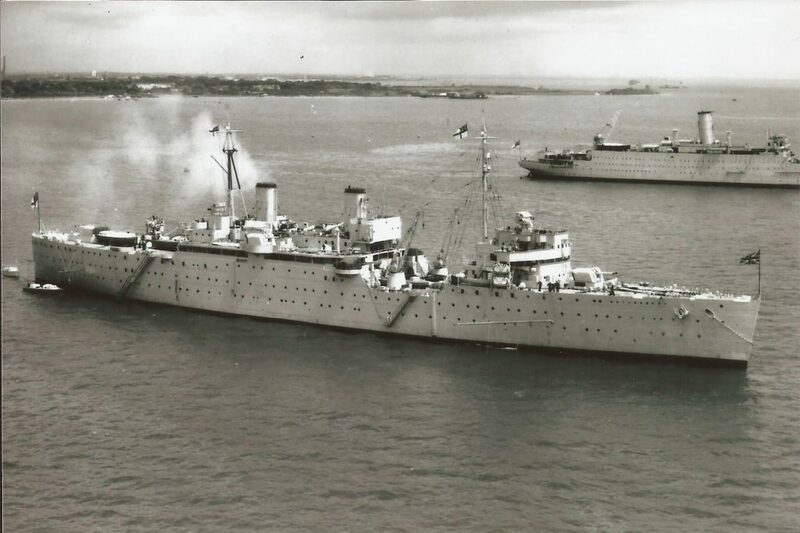 In June 1958, Captain Kerby asked the Parliamentary Secretary to the Admiralty what the estimated cost of the refits for HMS Ausonia had been during the financial years 1953 to 1958. 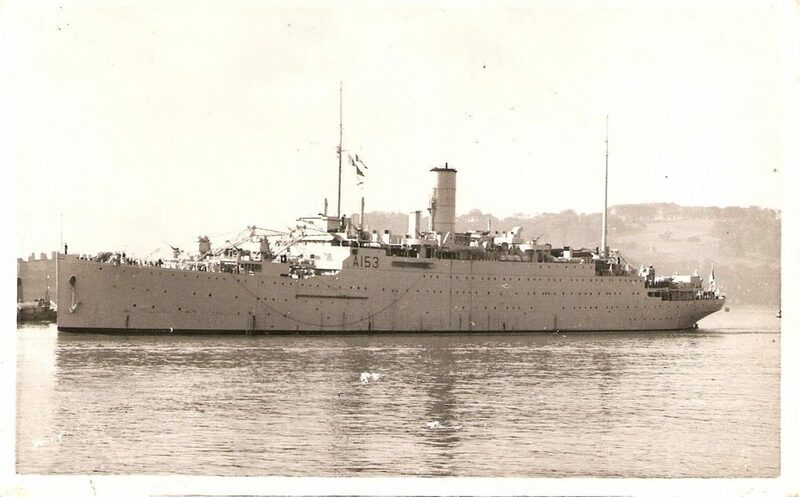 Mr Allan informed him that the estimated cost of refits for HMS Ausonia during those finial years was approximately £1.4 million. 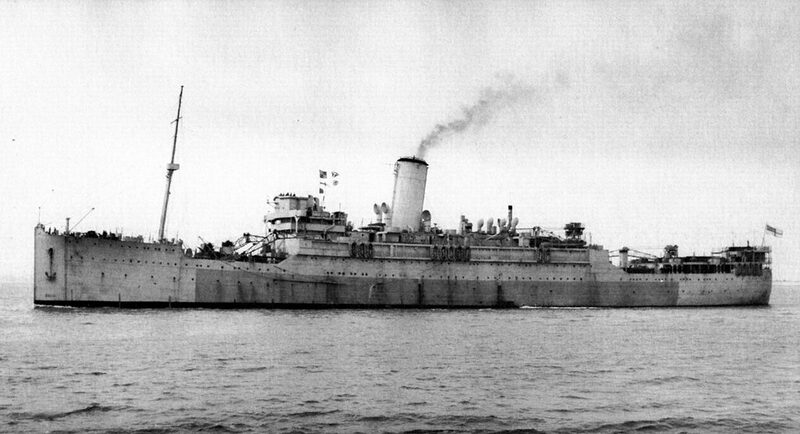 HMS Ausonia featured in an article in the December 1959 edition of the Navy News. 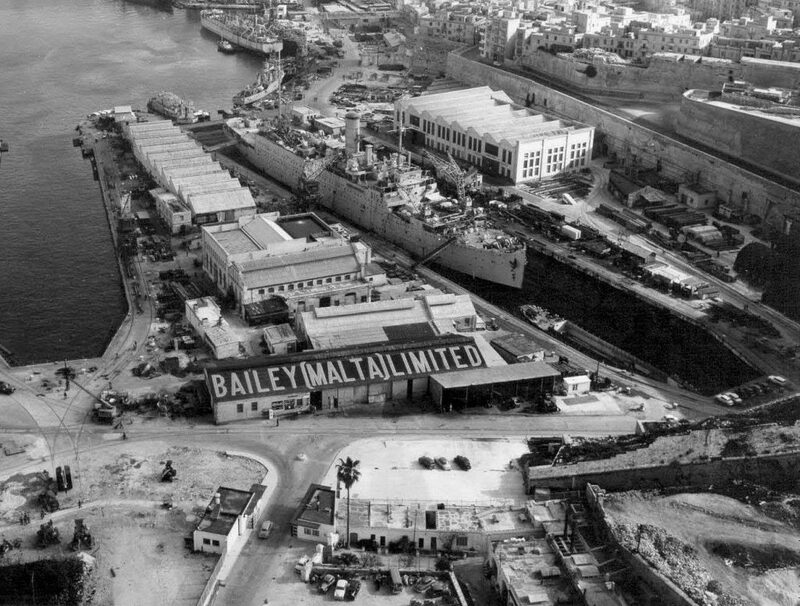 The article states that just a month after arriving in Malta, Ausonia had completed 500 jobs in the month of November 1958, which had taken 3500 man hours. The article also lists Ausonia’s ports of call in her summer 1959 trip, Naples and Salerno in March, Ajaccio (Corsica) in June and Genoa, in September. 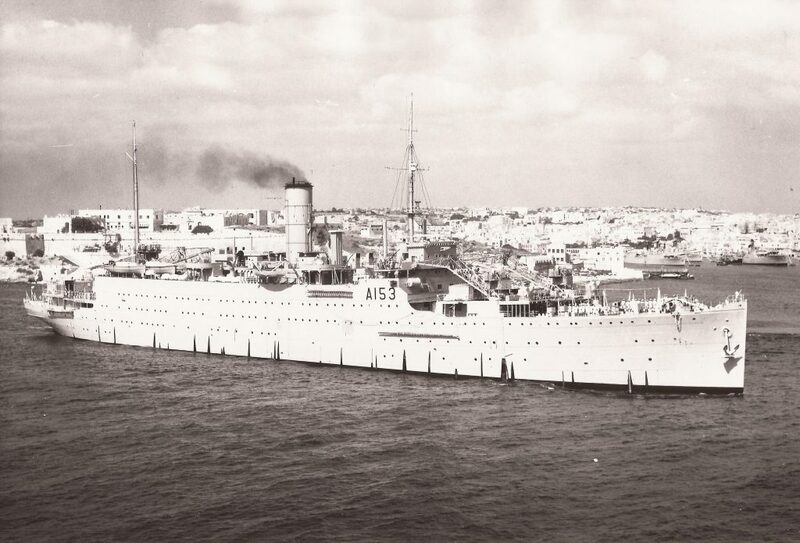 HMS Ausonia seen here returning to Malta after her 1960 summer cruise. 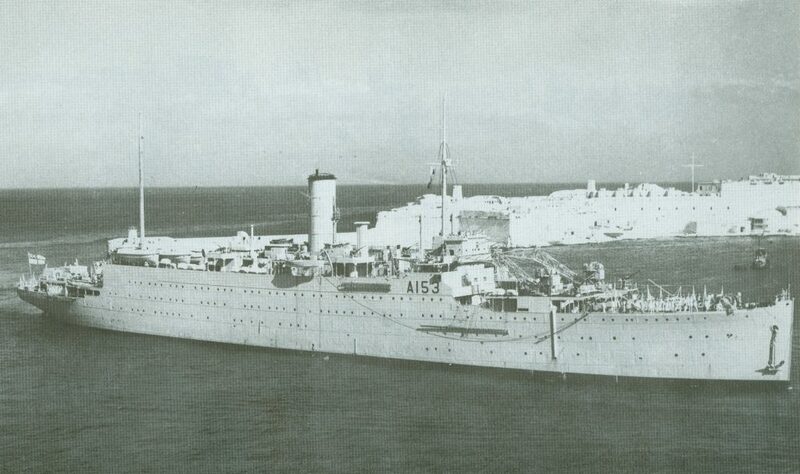 In 1961, HMS Ausiona left Malta for her summer cruise to Southern Italy. 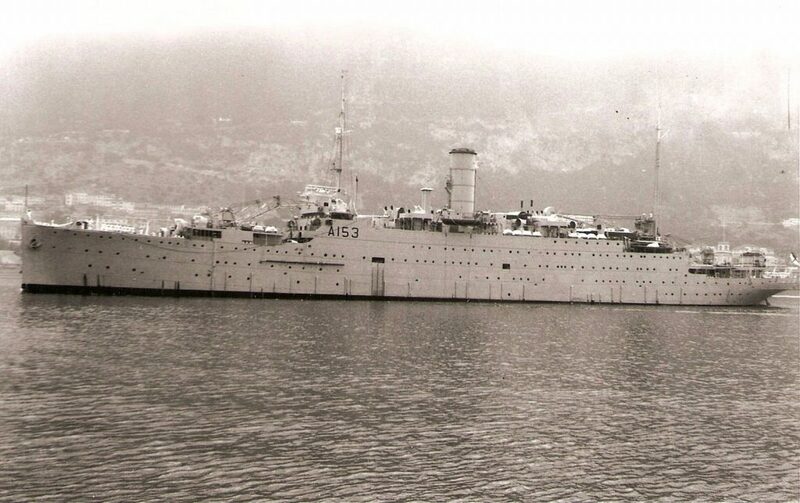 HMS Ausonia seen here arriving in Southern Italy 1961. 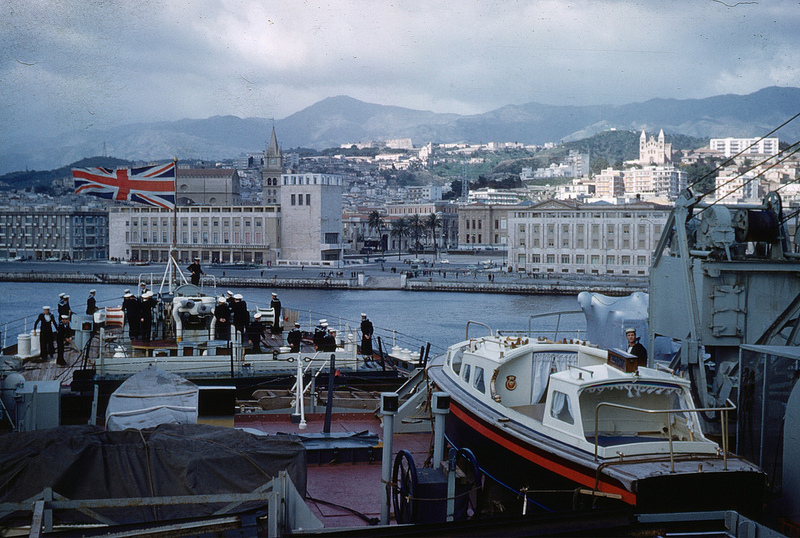 HMS Ausonia berthed in Naples harbour, Italy 1961. 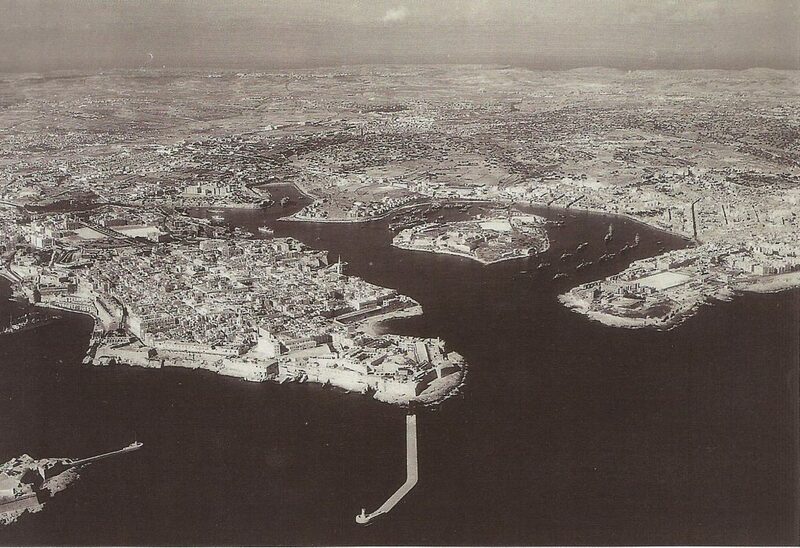 Sliema Creek, Malta in 1961 with both RN and USN ships in evidence. 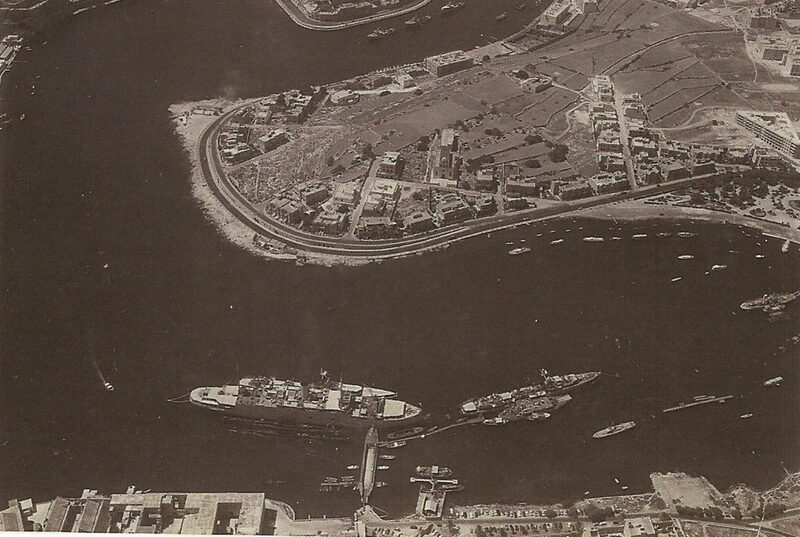 The photograph shows the Signal Training Centre (STC) on Manoel Island, HMS Phoenicia and in the distance, HMS Ausonia in Lazaretto Creek. 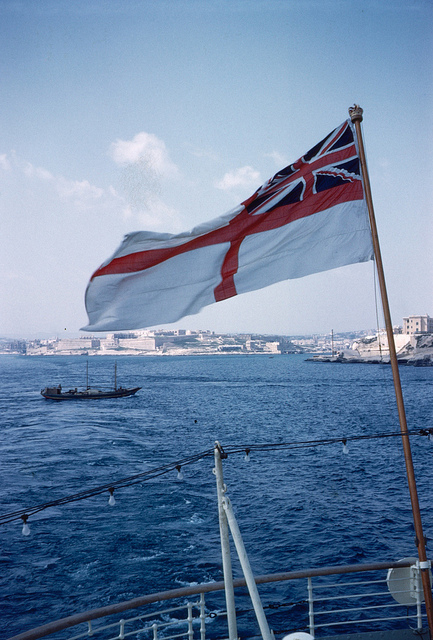 In June 1962, HMS Ausonia became the flagship of the Flag Officer Mediterranean Flotillas. 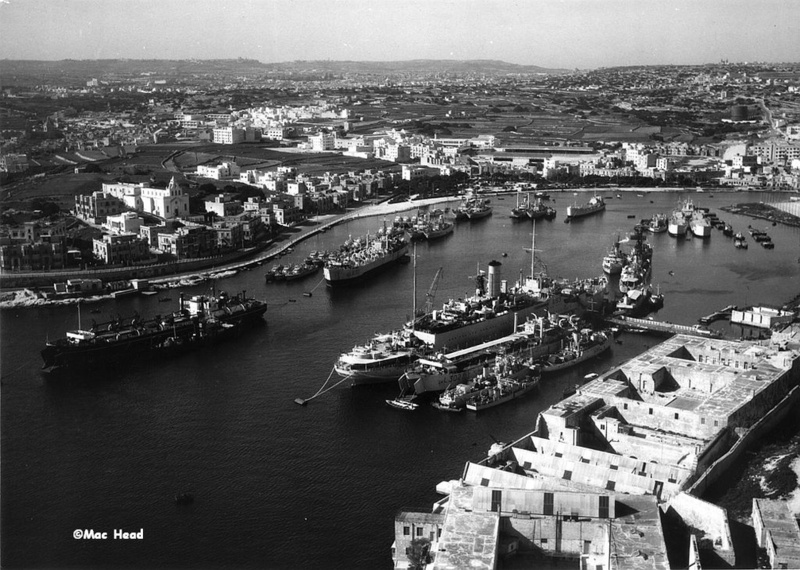 Whilst in Malta she also acted as the accommodation and repair ship for the 5th Submarine Division. 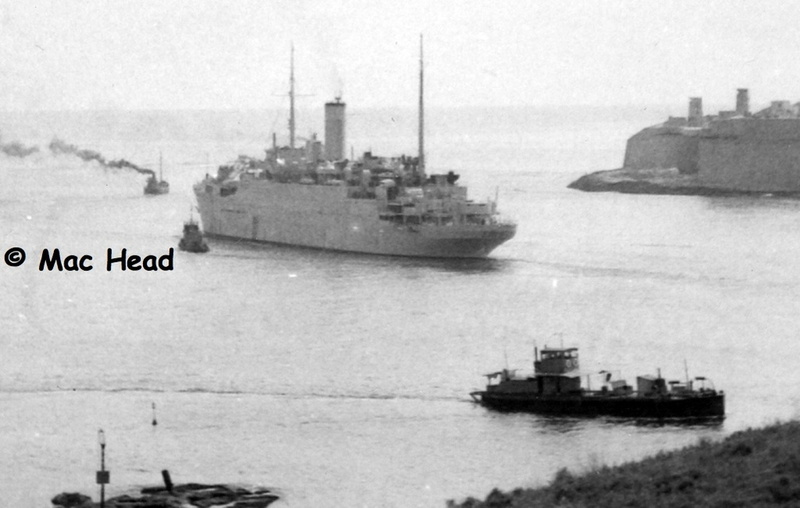 HMS Ausonia in Lazaretto Creek, now the accommodation and repair ship for the 5th Submarine Division based in Malta. 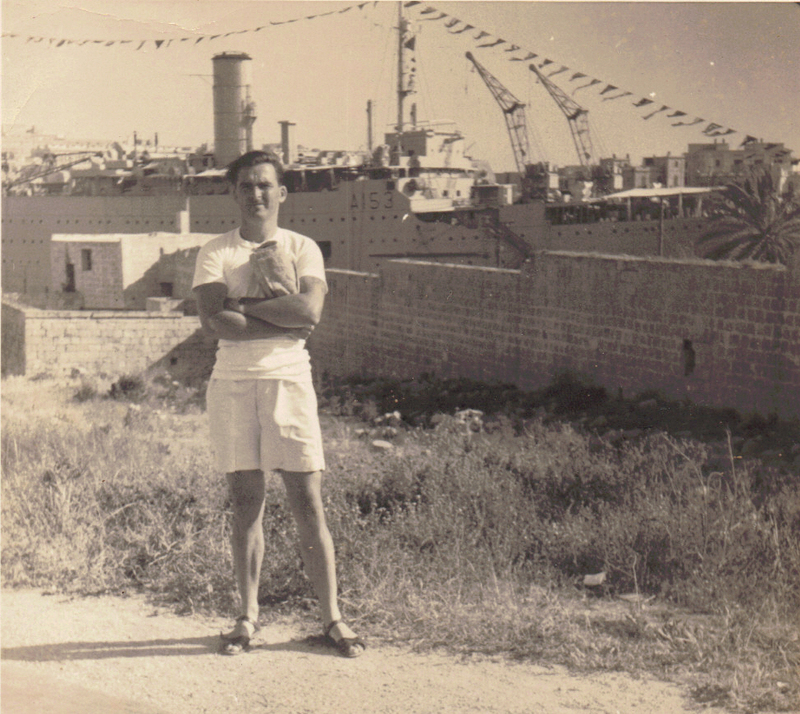 Leading Electrical Mechanic (LEM) D. Howlett, with the HMS Ausonia in Lazaretto Creek, Malta 1962. 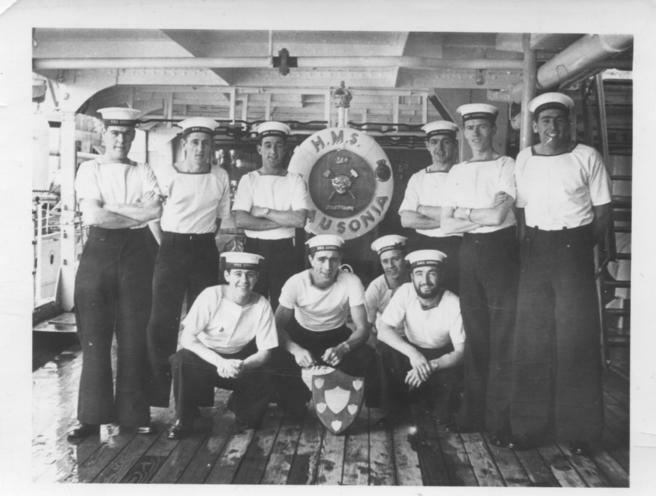 Crew members on board HMS Ausonia, Malta 1962. 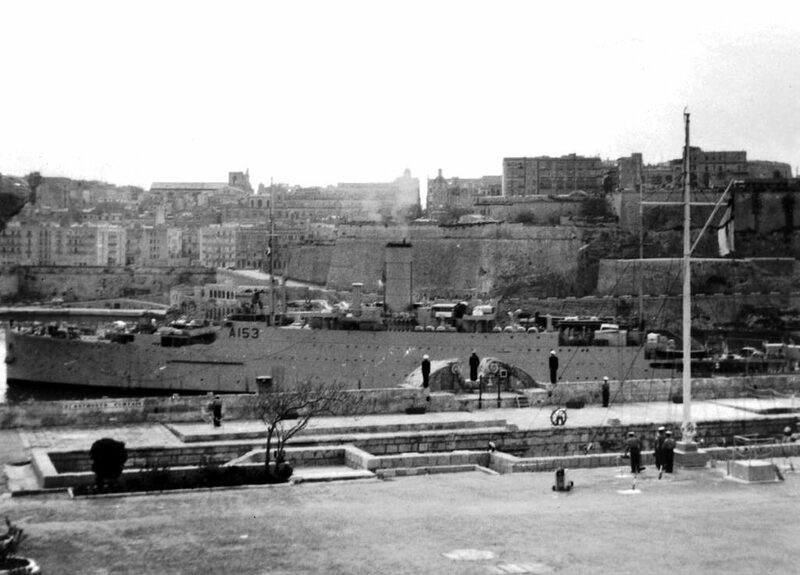 HMS Ausonia in Malta, Easter of 1962, with un-identified destroyers berthed each side of her. 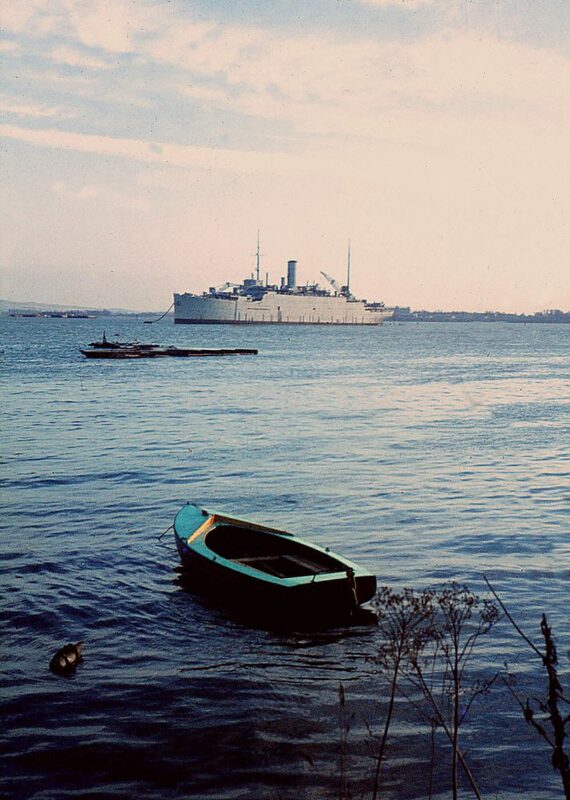 HMS Ausonia in Lazaretto Creek, Malta 1962. 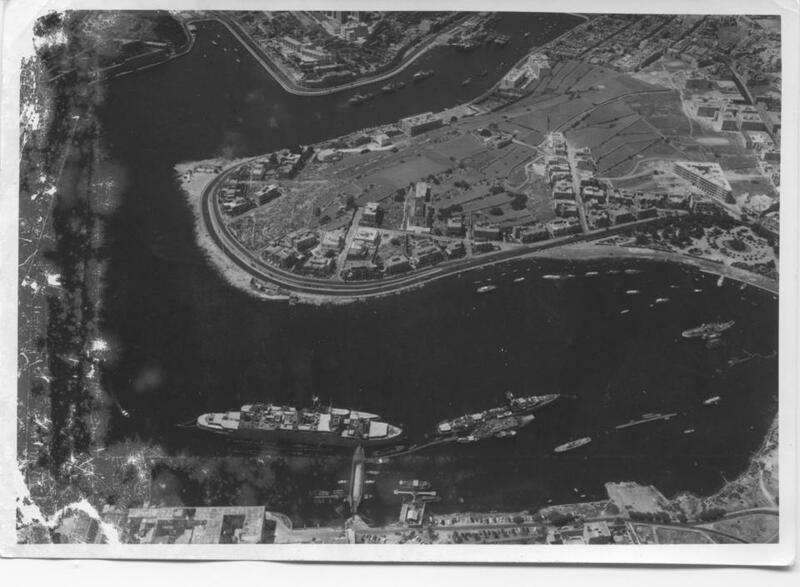 An aerial photograph of Lazaretto Creek, Malta, with HMS Ausonia, at her berth on Manoal Island, taken sometime in 1962. 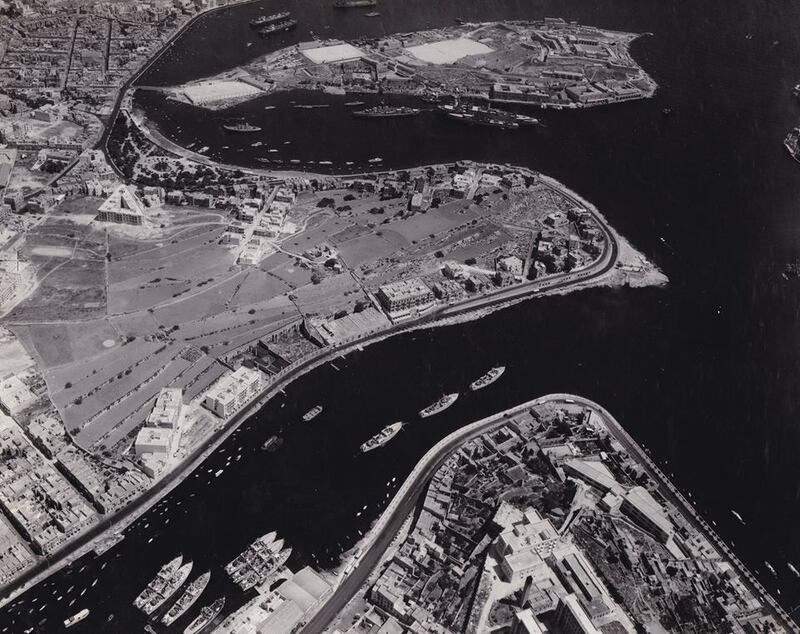 A wonderful aerial photograph of Lazaretto Creek, Malta, with HMS Ausonia, at her berth on Manoal Island in the centre, with the Mediterranean fleet anchored all around in the spring of 1960. Taken by the same photographer in the spring of 1960, another photograph of Lazaretto Creek. 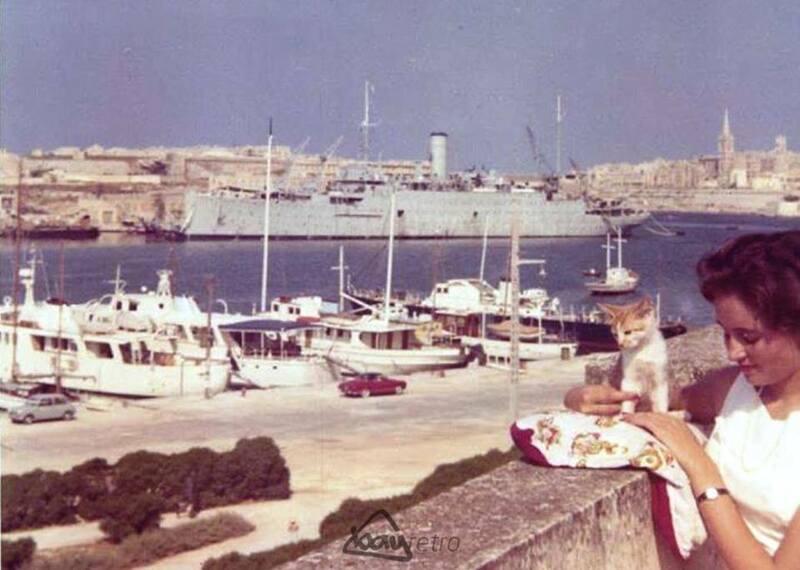 Diana Borg Cardona of Malta, shares a view of Ta’ Xbiex yacht marina from 1960, with HMS Ausiona in the background and kitten, Nonni in the foreground. 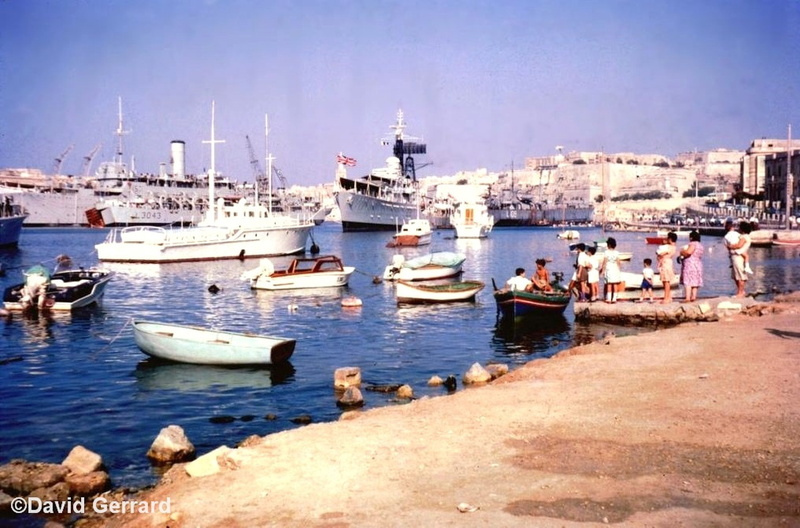 HMS Ausonia in French Creek, Grand Harbour, Malta, believed to be sometime in 1962. Large ships would normally anchor in this creek waiting to enter dry docks. 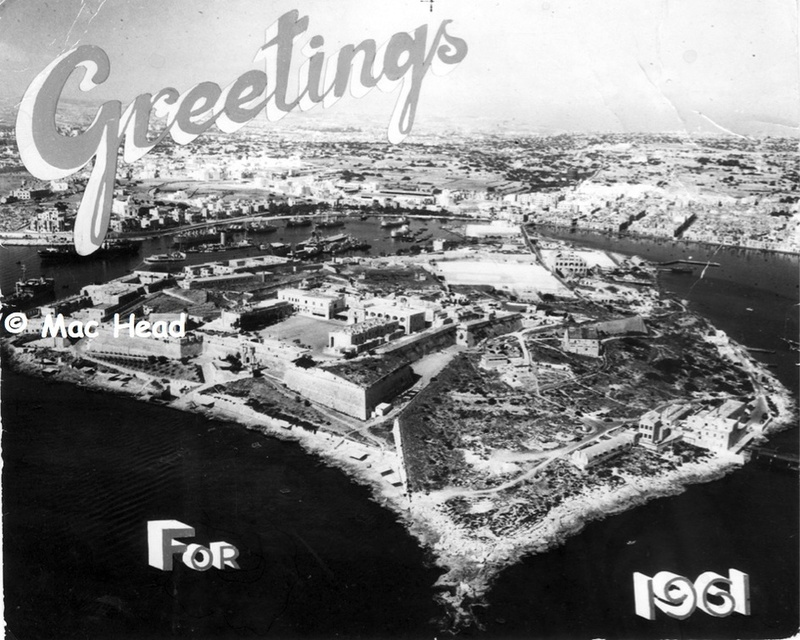 In 1962, Chief Petty Officer James Wilson from HMS Ausonia, was featured in several articles in the Maltese newspapers. 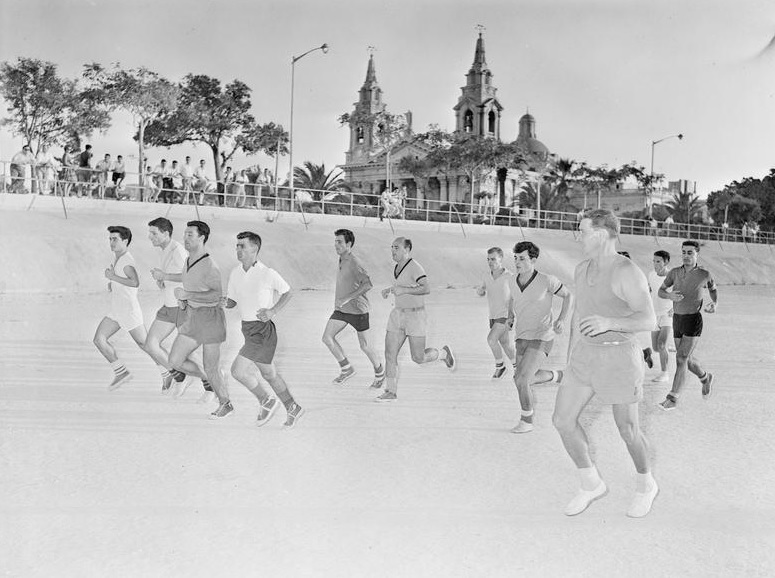 As a Royal Navy physical instructor, he had been invited to train the Floriana football team and through his efforts, they went on to win the Maltese championship. For the first time ever, Malta entered the European cup championship and on the 18th September 1962, Floriana played Ipswich Town in the first round of the European cup championship at the Empire Stadium in Gzira. The final score was 4-1 to Ipswich Town. The second round match against Ipswich Town was at the Portman Road football ground in Ipswich on the 25th September and the final score this time, was 10-0 to Ipswich Town and as a result, Floriana were knocked out of the championship. 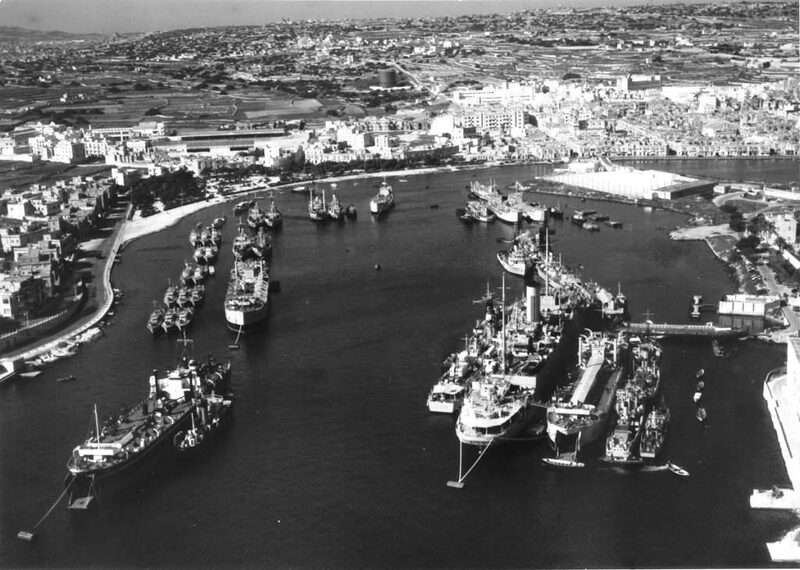 The Reserve Fleet in Lazaretto Creek, Malta 1962, with HMS Ausonia in the centre. 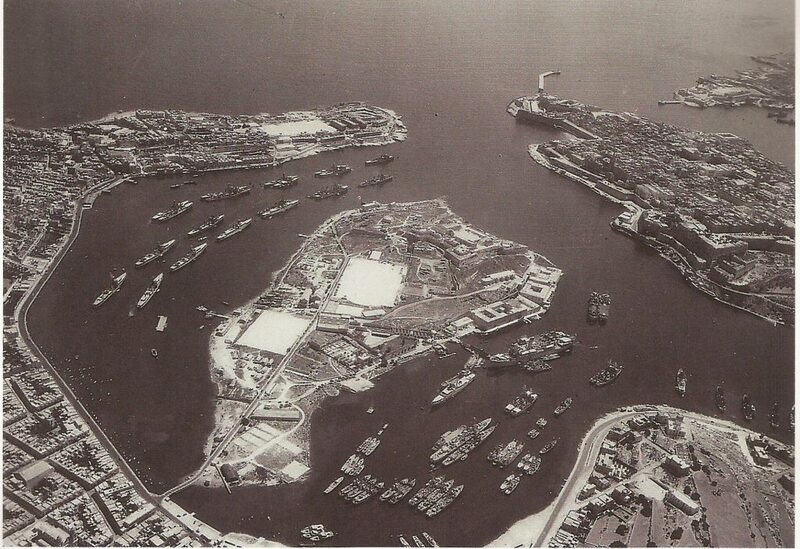 Another photograph of the Reserve Fleet in Lazaretto Creek, taken around the same time in 1962, with HMS Ausonia again in the centre. 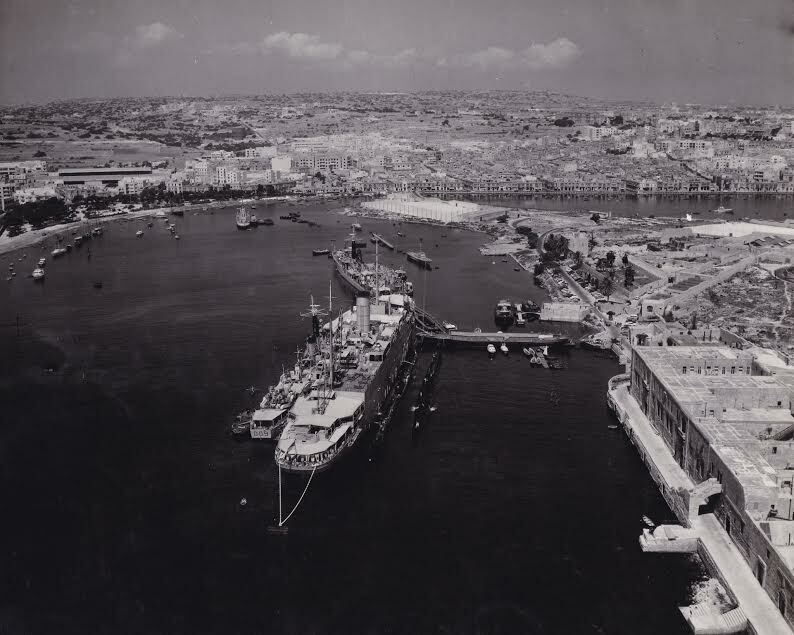 This photograph has been kindly supplied by Raymond Robinson, a former crew member of HMS Ausonia while stationed in Malta. 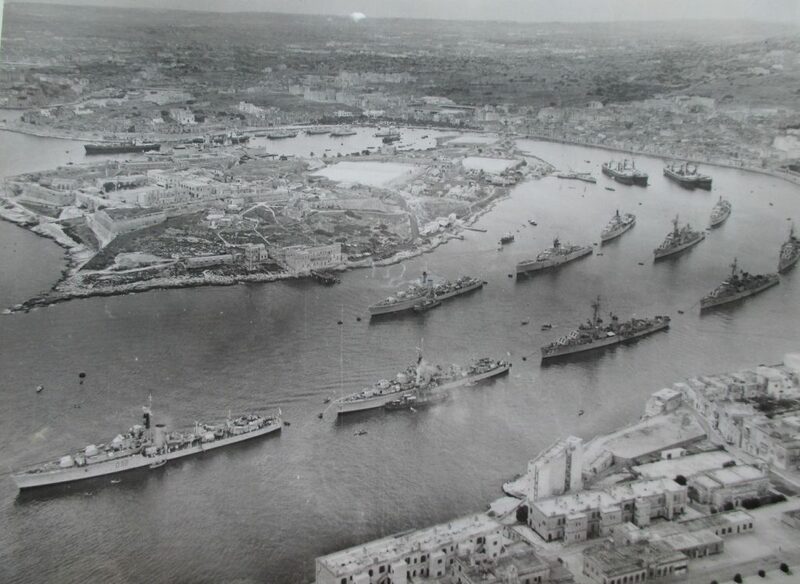 Another photograph of the Reserve Fleet in Lazaretto Creek, Malta 1962. 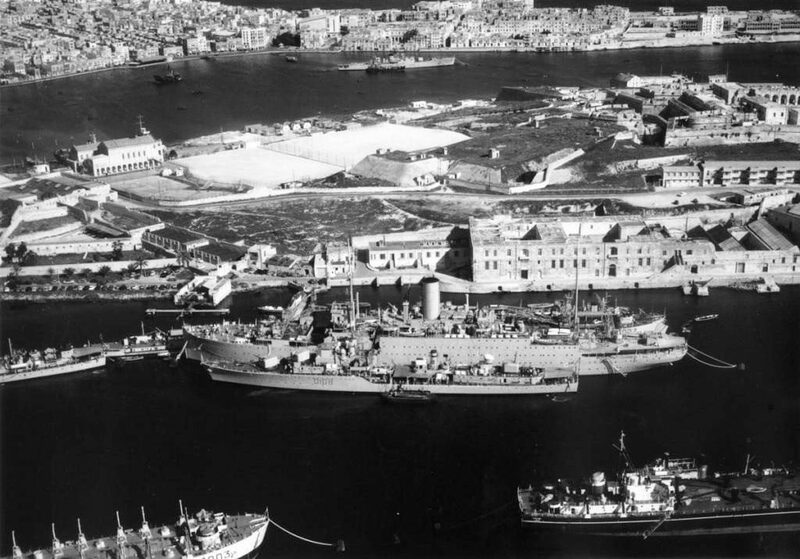 HMS Ausonia entering Grand Harbour, in Malta 1962. 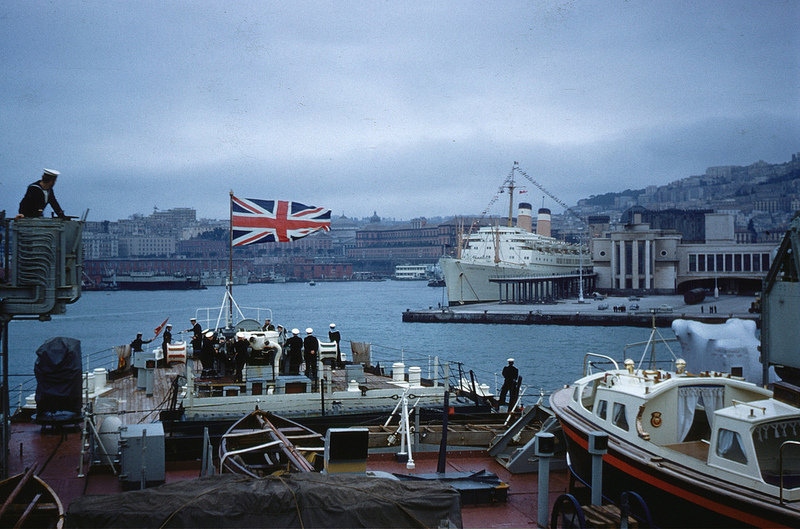 Another photograph of HMS Ausonia entering Grand Harbour in 1962. 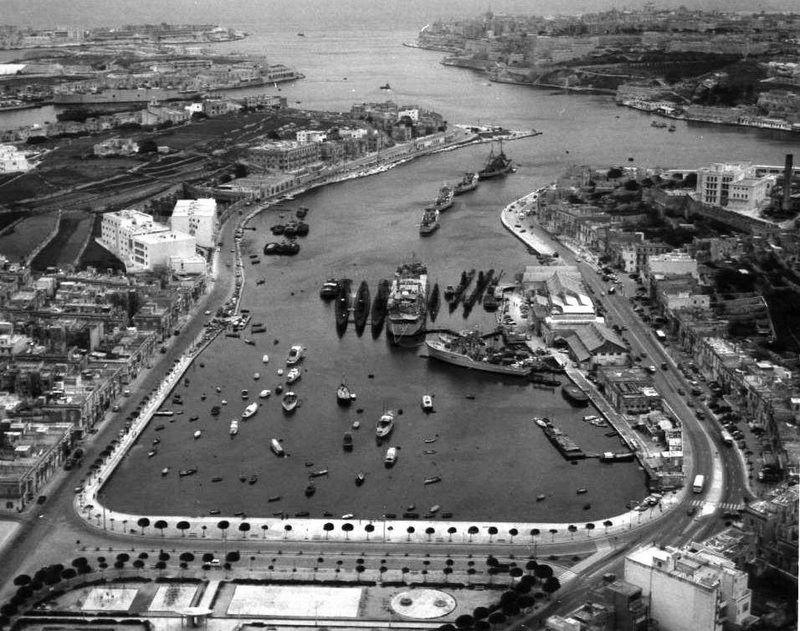 The US Navy Balao Class submarine, USS Piper seen here reversing out of her moorings in the Grand Harbour, Malta sometime in 1963. 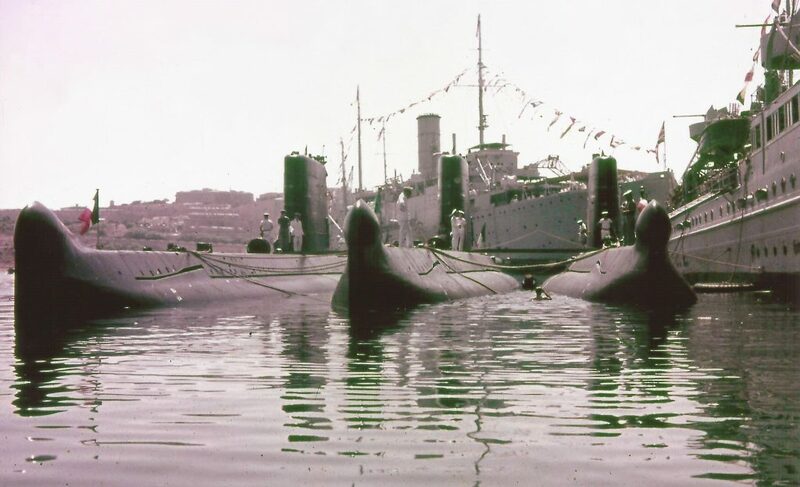 In the background is HMS Ausonia with HMS Agincourt alongside on the left and the US Navy Trench Class submarine, USS Sirago on the right. 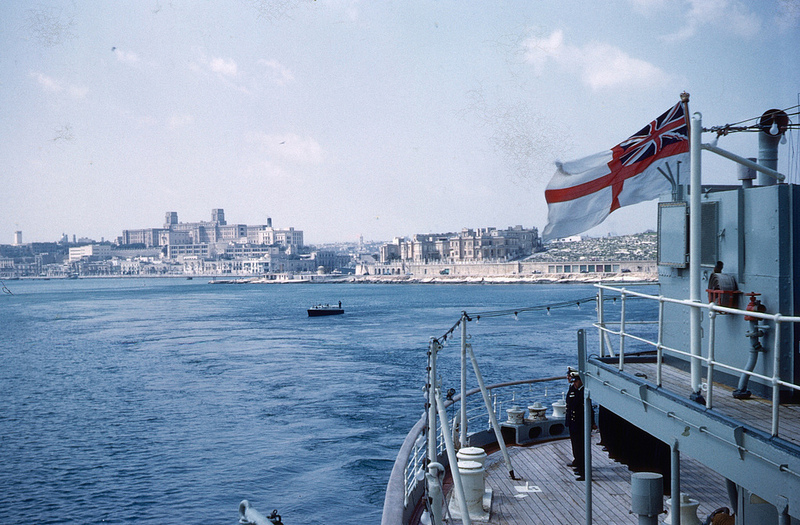 HMS Ausonia photographed here leaving Grand Harbour, Malta 1963. 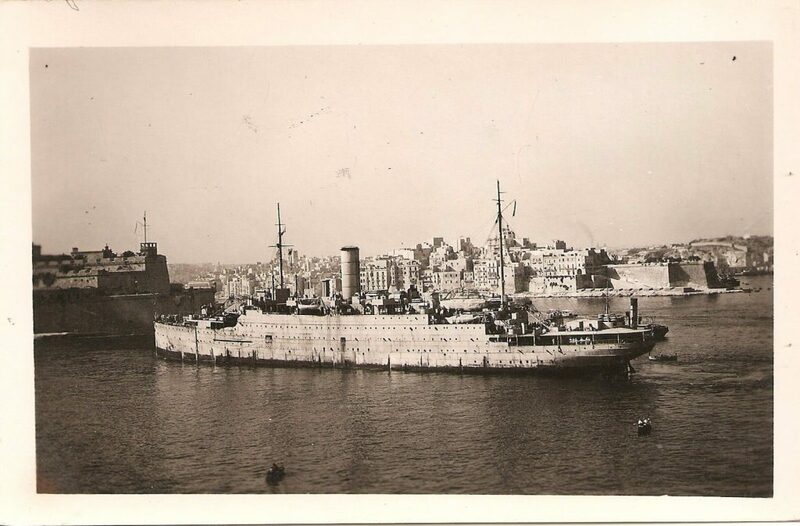 Unusual bows on photograph of HMS Ausonia leaving Malta. 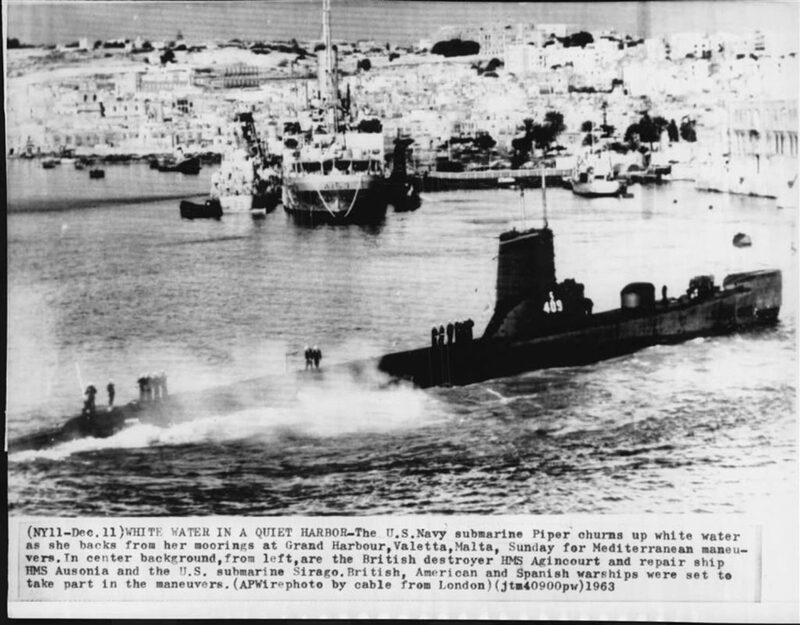 In 1964 during a “Families Day” show off the coast of Malta, HMS Ausonia was attacked with dummy Mk 9 torpedoes on her port side, fired from either HMS Turpin or HMS Thermopylae both T Class submarines, based at Malta. 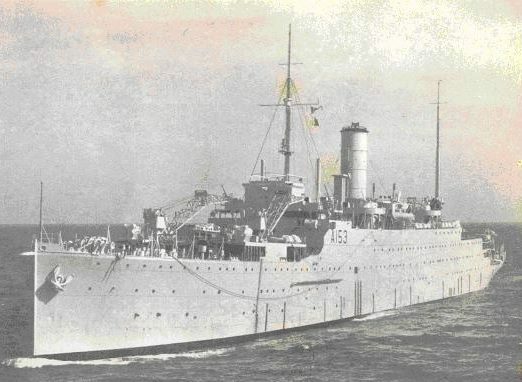 HMS Ausonia was used for target practise because she was one of the few warships left in the Royal Navy that had a strong enough steel hull to withstand the blows. 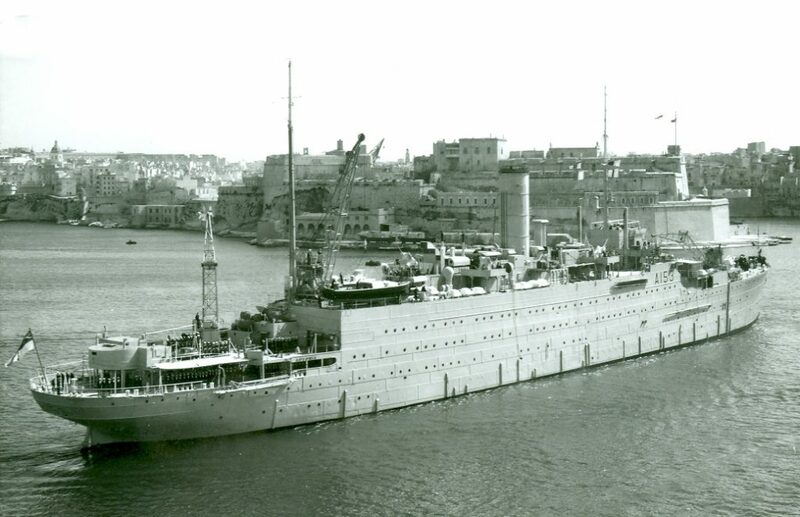 After the display, HMS Ausonia dropped the families off back in Malta and immediately set sail for Greece but unfortunately had a luboil failure to one of the engine bearings and the ship was towed back into Grand Harbour for repairs. This photograph (courtesy of the Navy News) shows the families lining the rails to watch the torpedoes hit HMS Ausonia. 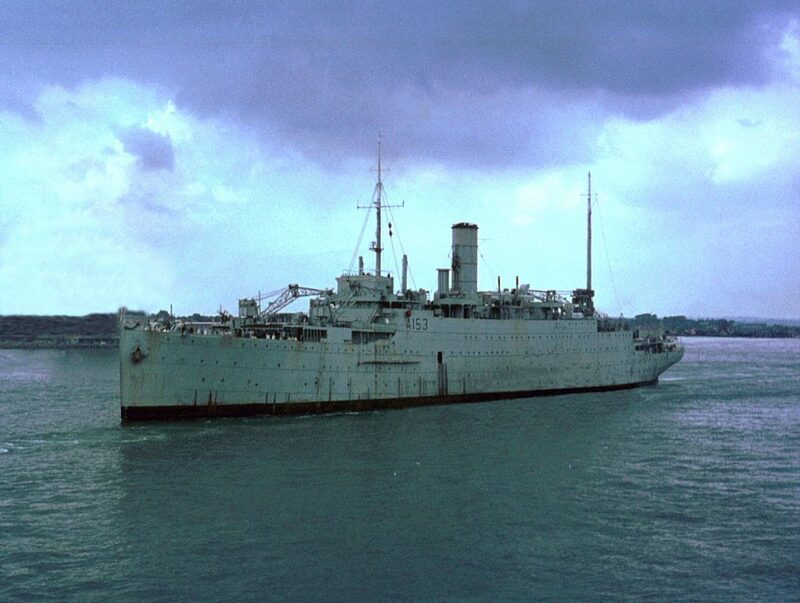 On completion of the repairs to the engine bearing, HMS Ausonia left Malta for the last time arriving in Portsmouth on the 7th August 1964 to pay off for disposal. 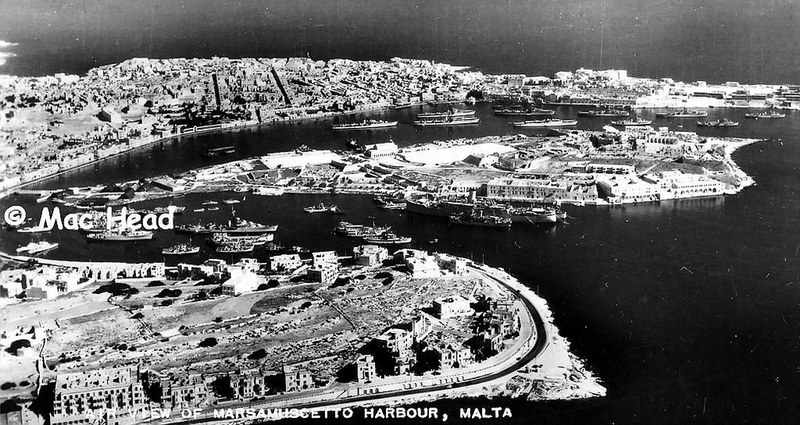 Her retirement from Malta was due to the gradual reduction of British forces in Malta, which had seen the disbandment of the 5th Submarine Division. 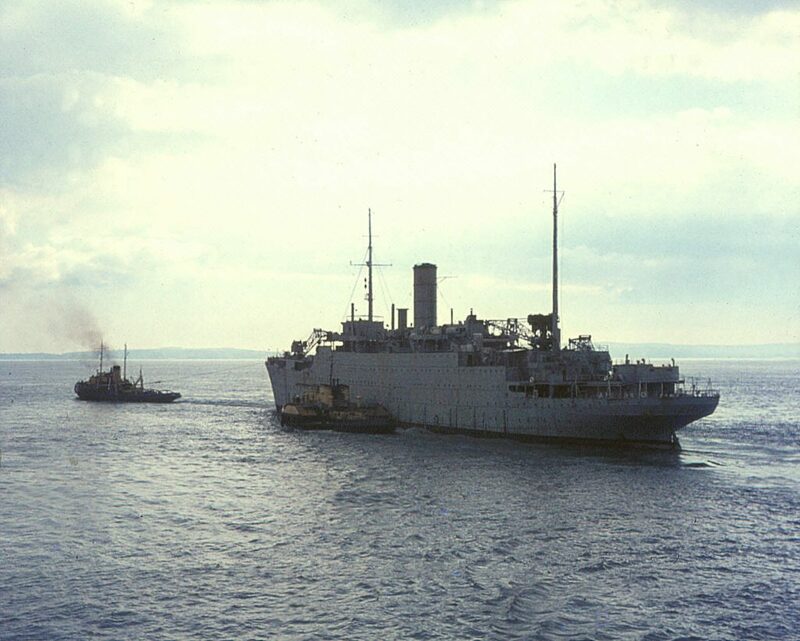 HMS Ausonia on her way back to the UK in 1964. 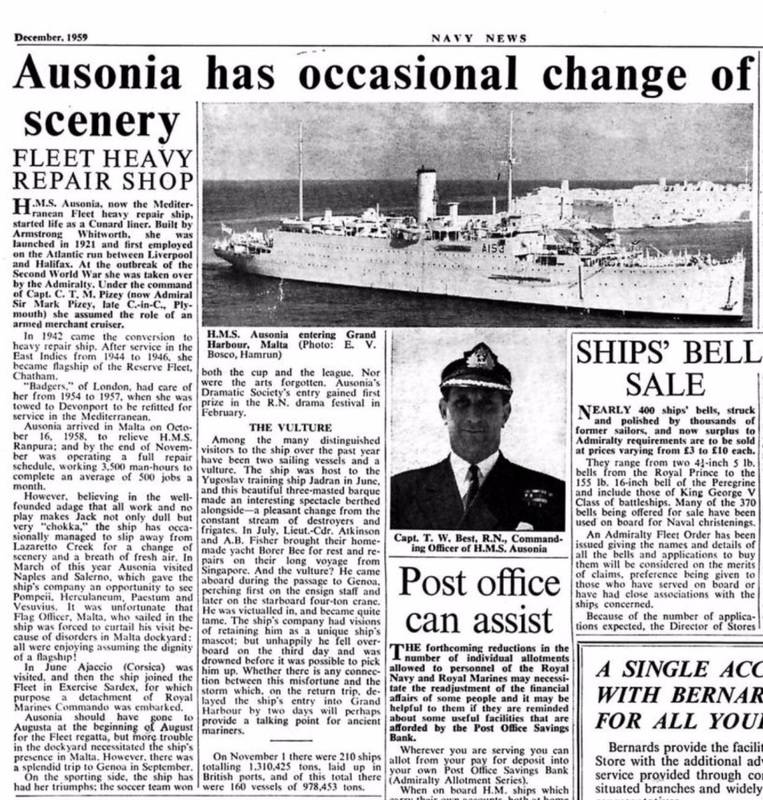 This photograph of HMS Ausonia seen here in Taxbiex Creek, Malta, appeared in the Huddersfield Daily Examiner newspaper on Monday 17th February 1964. 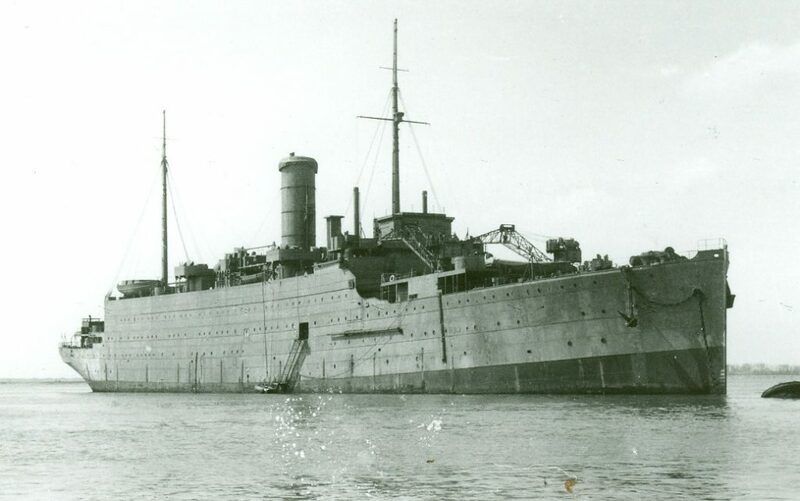 HMS Ausonia had been put on 12 hours’ notice to sail to Cyprus, in case she was needed to evacuate British families from the island during the fighting between the Turks and the Greeks. 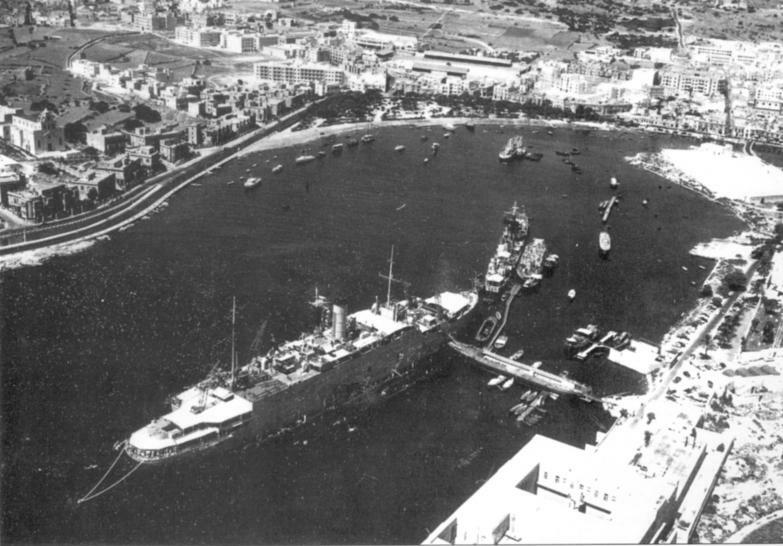 At the time, HMS Ausonia was attached to the British Mediterranean Fleet based at Malta and as can been seen in the photograph, all the submarines and other craft which were normally alongside her, had been moved away in readiness. 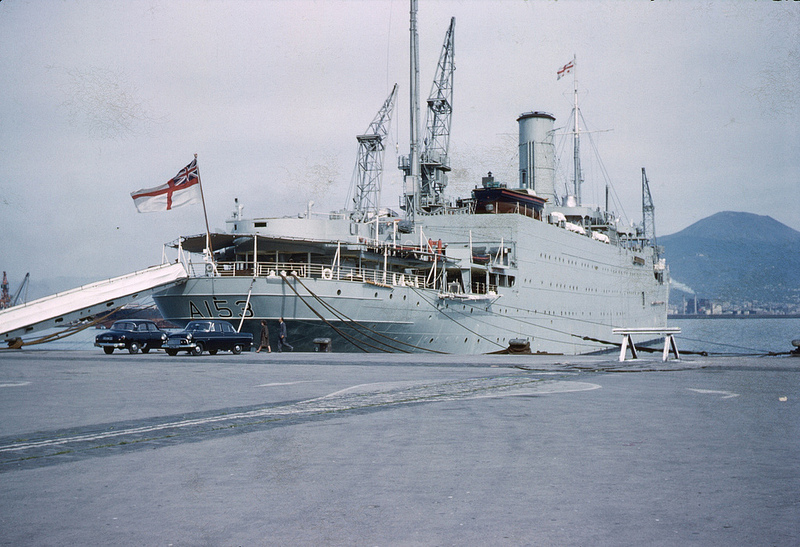 HMS Ausonia photographed in Portsmouth Harbour, in November 1964, awaiting a decision on her disposal. (Copyright Portsmouth News). HMS Ausonia photographed in Portsmouth Harbour in April 1965 with the C Class destroyer, HMS Carron alongside, which was also awaiting disposal. 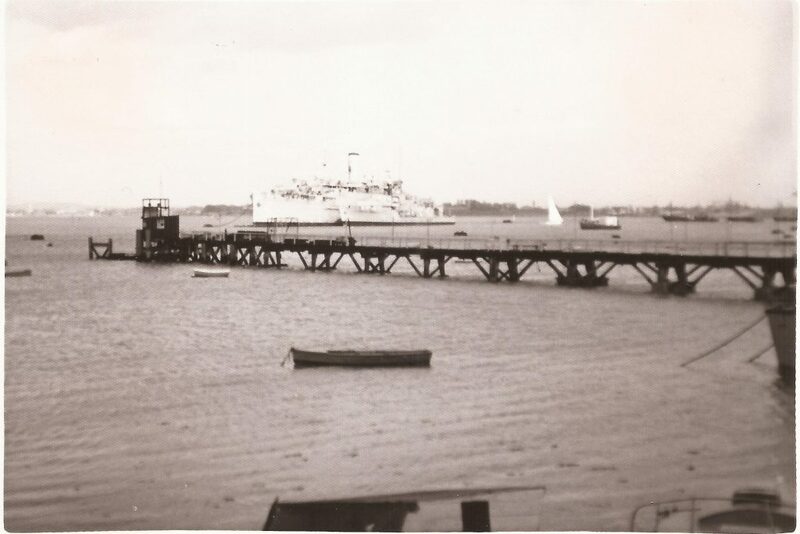 Finally, in September 1965 she was sold to a Spanish ship breakers and on the 13th November 1965, she left Portsmouth under tow for Castellon and the cutting torches of the scrap yard. The following sequence of photographs was taken by Graham Stevens on the 13thNovember 1965 and show HMS Ausonia leaving Portsmouth under tow on her way to the breakers. They are almost certainly the last photographs ever taken of the ship. 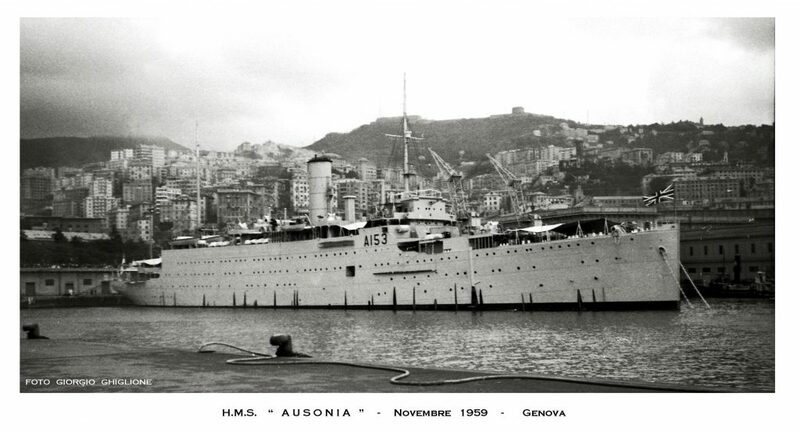 The Ausonia had served 18 years as a Cunard White Star passenger liner, 3 years as an Armed Merchant Cruiser and finally, 23 years as the fleet repair ship HMS Ausonia. 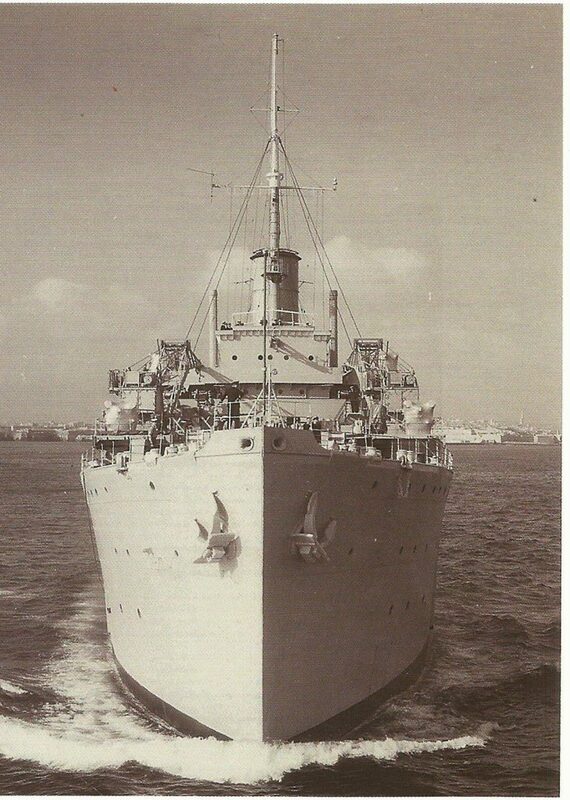 She had given a total of 44 years’ service and so past the last of the Cunard White Star, A Class liners.